I have used David Allen’s book, Getting Things Done: the art of stress-free productivity (Penguin: NY 2001) both personally and with clients for a number of years. Recently I volunteered to lead a discussion of the book’s approach to personal productivity with the Greater Boston Business Network. This provoked me to re-read the book in preparation. Here are a few thoughts following my re-read and the discussion with GBBN. Work and personal are now quite blurred. And so, this book is about everything in your life. There is no boundary between work and personal when it comes to being more productive. And, your mind does not treat them as separate, so a productivity system can not either. There is also a need to incorporate the big picture, strategic view, with the tactical day-to-day, but the emphasis must be on actionable tasks. Thus, the title, Getting Things Done. Allen builds his approach to productivity on a few “principles”. A key phrase here is: “trusted storage system”. It is exactly the trusted storage system that both gets all this stuff out of our heads and away from the worrying, fretting machinery of the mind and provides a robust platform for action. In the trusted storage system, we know that nothing is ever lost and we know where to turn to find the next action. Allen calls this step “Mind Sweep”. Allen provides a long list of memory triggers to help you remember all of the “stuff” in your life and get it down on paper and out of your head. He clearly see that being more productive is all about making choices correctly and taking action, getting things done. Time takes care of itself as it will inevitably. 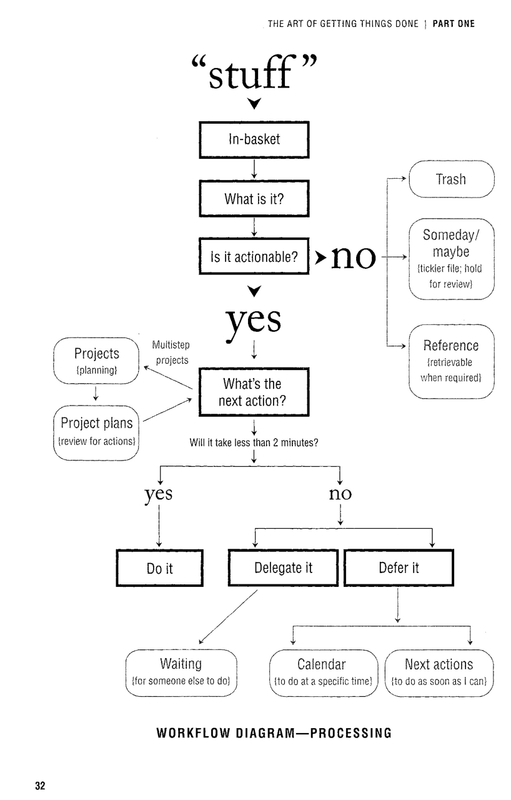 Managing action requires horizontal and vertical action management. The horizontal manages the current environment of tasks while the vertical organizes the longer and more complex projects that frequently also require more complex social involvements with others to get things done. This is where project management fits in. In my work with Getting Things Done, two practices have proven most valuable. First, I regularly go back to the “Mind Sweep”. I tend to build up a worrying collection of stuff especially obligations to others. The mind sweep helps me put these down on paper and also reminds me to be more disciplined about making commitments that many times I should not make in the first place. Second, I have really put in practice Allen’s ruthless passion for filing things away. I have a two part system. First, there is filing of clients in alphabetical order. Then, in separate filing drawers everything else is filed alphabetically. And, following Allen’s office design principles, these file drawers are at easy reach from my desk chair. No need to get up to find anything in this file system. I even own a P-Touch label maker and regularly make labels for my file folders. One point that came up during the discussion with business people at the Greater Boston Business Network is that the exact shape of your “trusted system” is not so important. If you have a reliable system like Day Timer working for you, keep at it. Though, perhaps you can improve your productivity through applying some of the other tools in Allen’s approach. Now, six years on from my first read of Getting Things Done, this little book remains a useful tool. If you have not read it, go to your local library or visit the bookstore, physical or virtual. 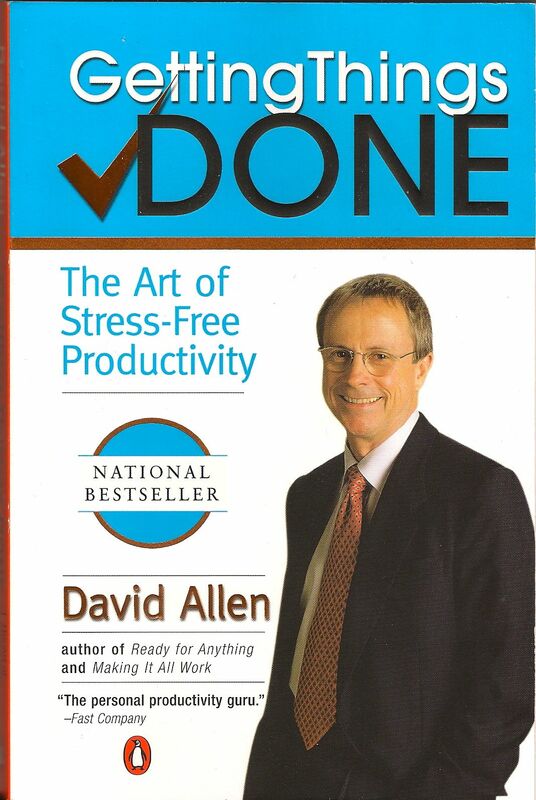 Also, go to David Allen’s website learn more about his personal productivity tools. This entry was posted in Book Reviews, Productivity and tagged action steps, actionable, David Allen, machinery of the mind, personal productivity, practice, Productivity, productivity by david allen, results, tasks, things done the art of stress free productivity, Time by Mark Orton. Bookmark the permalink.